This was how FDC Misamis Power Corporation (FDC Misamis) President and Chief Executive Officer Juan Eugenio Roxas described the Capitol’s 2018 Tax Awards that recently feted FDC Misamis as the number one real property taxpayer in the entire Misamis Oriental from January up to the end of the third quarter of 2018. He added that it is inspiring, too because the company is determined to further take care of the people within its host communities through various corporate social responsibility (CSR) programs and projects. FDC Misamis, a wholly-owned subsidiary of FDC Utilities, Inc. (FDCUI), the utilities and infrastructure arm of Filinvest Development Corporation (FDC), operates a 3x135-megawatt (MW) circulating fluidized bed coal thermal plant at Phividec Industrial Estate in Villanueva town. The company remitted a total of P251,732,084.96 to Phividec as of the end of third quarter this year. Of the total amount, P60,698,039.72 went directly to the Provincial Government’s coffer, provincial treasurer Ronald Jame Violon said. “Indeed, FDC Misamis really made a significant and remarkable contribution to the province,” Violon said. Violon added that the huge tax collected by the capitol will be used for development programs especially in the health sector, including sustainable feeding for kids. 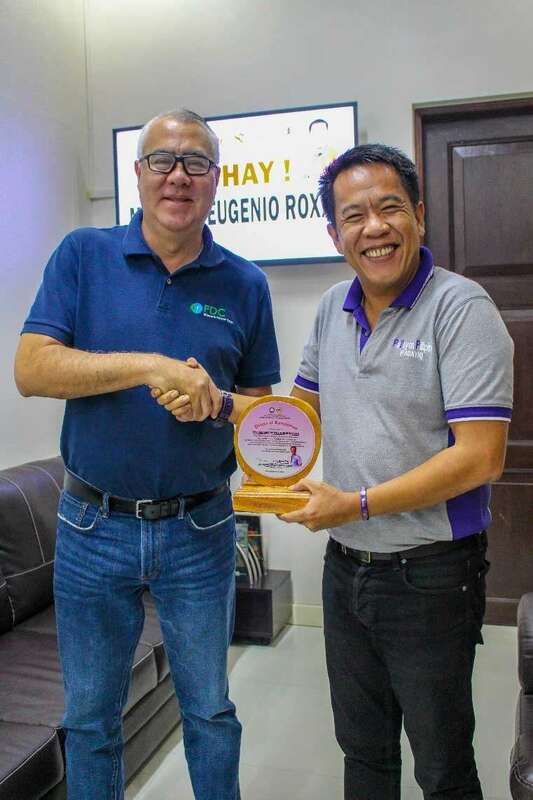 “We acknowledge and recognize, therefore, the support of all the companies located in the province, especially FDC Misamis for their efforts of paying taxes at the right time,” Misamis Oriental Governor Yevgeny “Bambi” Emano said. Misamis Oriental, therefore, is blessed with Filinvest choosing to invest in the province, especially in the power industry, Emano said. Taxes collected, he added, will boost the Capitol’s delivery of basic services to the Misamisnons. He said effective tax collection will also enhance our advocacy on good governance. “Let me grab this opportunity to thank the Gotianun family, their president, Mr. Johnny Roxas, and all the men and women of Filinvest for paying your taxes, for serving our people and for bringing development in the island of Mindanao,” he said. Violon said the awarding ceremony held at the Capitol grounds on Nov. 26 was just a mere “pasasalamat (gratitude)” to all real property tax payers in the province, who made remarkable tax contributions this year. “For quite so long, we didn’t have this kind of awarding until we realized that it’s really a must now just to say thank you to our taxpayers,” he said. Violon added that it is also aimed at “enticing” more and more investors or locators in the province to do their share of paying their taxes promptly. Roxas said no matter how simple the award is, the meaning of such really impacted FDC Misamis to strive more in the upcoming years. “Hence, aside from Gov. Emano, we also would like to thank all Misamisnons for accepting and supporting us in operating a power plant here in MisOr,” he added. FDC Misamis is somehow one among those who addressed the recurring brownouts in Mindanao sometimes from 2013 to 2015. With the current notable increase of 17.27 percent on Mindanao power demand from January to December 2018, Roxas said FDC Misamis’ expansion is now in the offing. The firm’s president said they have no choice but to prepare for the unstoppable “mushrooming” of businesses on Mindanao island. He also dispelled criticism that FDC Misamis is selling its generated power to various Mindanao electric cooperatives at a high price. “Ours is the cheapest and most dependable in Mindanao, so far,” Roxas reiterated.